Examining Ohio’s key counties (and winning/losing margins)… Obama yesterday: “What we have right now is a lead that we’ve maintained”… Romney yesterday: “We are going to win”… Powell -- again -- backs Obama… The Mourdock story continues… New NBC/WSJ/Marist polls (of Colorado and Nevada) come out at 6:30 pm ET (Update: They're here)… Obama stumps in Florida, Virginia, and Ohio, while Romney spends his whole day in the Buckeye State… And it’s also debate night in the Buckeye State: Brown vs. Mandel. The Daily Rundown's Chuck Todd reports on President Barack Obama's final push to net early voters and break the dead heat in the campaign. Both Bush and Obama received 51% of the vote in Ohio in 2004 and 2008. The one TRUE swing county is Hamilton, which both men won. But just as important are the margins. Note that Obama won the Democratic-leaning Cuyahoga and Lucas counties by wider margins than Kerry did, while Bush was able to minimize his losses in these two counties. So for the president, it’s about winning his counties by 2008 margins; for Romney, it’s about losing them by 2004 margins. What made Obama’s victory margins so impressive in 2008: There were fewer voters in Cuyahoga and Lucas. It’s a big reminder that for the Democrats, Ohio defies gravity for them. In just about every other swing state, the president is counting on NEW voters, population GROWTH (particularly among Hispanics) for instance. Ohio is a state that is getting older and smaller; does it also mean it gets whiter? On paper, it should be a state that actually moves away from the Democrats over the next few years, just like Missouri, and yet, it hasn’t. In an NBC News exclusive, Rock Center host Brian Williams travels with President Obama for two days on the campaign trail, attending rallies throughout the country as Election Day looms. 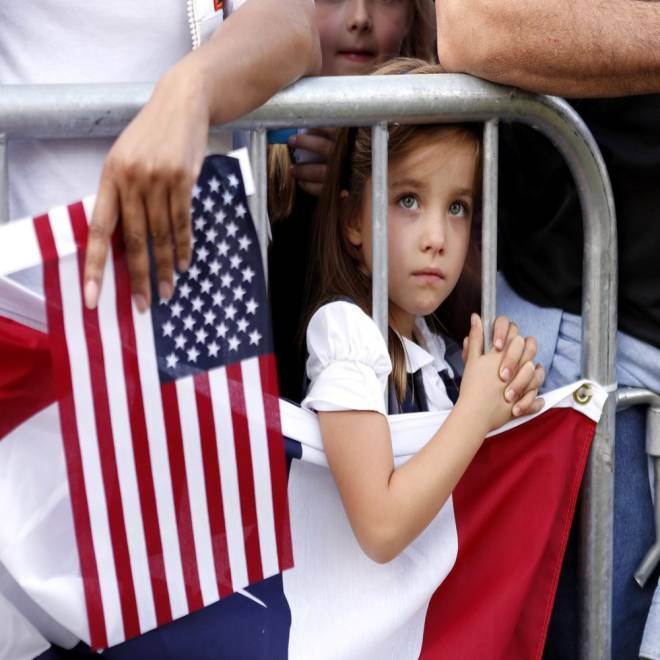 A young girl listens as President Barack Obama speaks during a campaign rally in Dayton, Ohio Oct. 23, 2012. *** Romney: “We are going to win”: Meanwhile, that “other guy” -- Mitt Romney -- campaigned yesterday in Nevada and Iowa. Here’s a dispatch from NBC’s Garrett Haake covering Romney in Cedar Rapids: "This is a defining election – defining for the nation but also defining for your family," Romney told a crowd of some 2,300 supporters there. "I say that because it will make a difference, this election will. A difference for the nation, a difference for the families of the nation and a difference for your own family." More Romney: "We are going to win, by the way." Romney’s tone is all about the soft sell to suburban women. And his advertising of late is matching the tone we’re hearing from him on the trail. It’s clear, Boston knows the difference between winning and losing is making sure the gender gap is small. If they are going to get crushed among Hispanics (the Post/ABC tracking had POTUS hitting 75%!!! with Latinos yesterday), then Romney has to pick up ground somewhere. As Mitt Romney embarks on a campaign blitz in key battleground states, Clint Eastwood is promoting the GOP candidate in a new Super Pac ad. NBC's Peter Alexander reports. *** On the trail: Obama begins his day with a rally in Tampa, FL at 9:20 am ET, then hits Richmond, VA at 12:50 pm ET, votes in Chicago, and then concludes his day with an event in Cleveland, OH at 8:55 pm ET… Romney spends his day in Ohio, visiting Cincinnati at 11:00 am ET, Worthington at 3:10 pm, and in Defiance at 7:35 pm… Biden heads to South Dakota to attend prayer services for George McGovern… And Ryan stumps in Virginia. *** Debate night: Brown vs. Mandel: By the way, part of your First Read team is in Cincinnati, where NBC’s Chuck Todd moderates a Senate debate between Sen. Sherrod Brown (D) and Josh Mandel (R) that begins at 7:00 pm ET. If you live in Ohio, you can watch on your NBC station.